﻿ Who are the BDS? WHAT IS THE BDS ? and acknowledgement of the right of return of Palestinian refugees. Critics further argue that the BDS movement disincentivizes the Palestinian leadership from negotiating with Israel at present, and that it is antisemitic in the form its opposition to Zionism takes,in resembling historic boycotts such as the Nazi boycott of Jewish businesses and in promoting the delegitimization of Israel. One of the objectives stated at the founding of the Arab League in 1945 was to "frustrate further Jewish development in Palestine by means of boycott against Zionist products". A central boycott office was established to coordinate this effort. After the establishment of Israel in 1948, the boycott of Jewish products from Palestine was transformed into the boycott of Israeli products and services. The boycott was conducted on a primary level (as a direct boycott of Israeli products), a secondary level (though direct pressure on states and institutions not to deal with Israel), and a tertiary level (to prevent companies from uninvolved third-party states from dealing with companies that had relationships with Israel). Marc Greendorfer argues that the BDS movement originated in the Arab League's boycott of Israel in name, in function, in tasks, in methodology and in goals. During the Second Intifada, Palestinians began developing international solidarity and support that could be used to apply pressure on Israel through non-violent means. In 2002, organizations in Europe, Australia, the United States, and the Palestinian territories called for a boycott of Israeli institutions, including a boycott of academic and cultural institutions. Palestinian academics and intellectuals also called for a boycott in October 2003. In 2004, an attempt to coordinate the boycotts gained momentum following the start of the construction of the Israeli West Bank barrier. In April 2004, the Palestinian Campaign for the Academic and Cultural Boycott of Israel (PACBI) was founded. One of the founders was Omar Barghouti. On 9 July 2005, the first anniversary of the advisory opinion by the International Court of Justice in which the West Bank barrier was declared a violation of international law, a large number of organizations representing Palestinians in Israel, Palestine and abroad called upon the international community for boycotts, divestment and sanctions against Israel until it complies with International Law and Universal Principles of Human Rights. At the first Palestinian BDS Conference, held in Ramallah in November 2007, the "BDS National Committee" (BNC) was established as the Palestinian coordinating body for the BDS campaign worldwide. The movement's main example and source of inspiration is the 20th century boycott of South Africa by the Anti-Apartheid Movement. The BDS campaign is organised and coordinated by the Palestinian BDS National Committee. The committee cites a body of UN resolutions and specifically echoes the anti-apartheid campaigns against white minority rule in apartheid era South Africa; the BDS campaign called for "various forms of boycott against Israel until it meets its obligations under international law". BDS protest in Melbourne, Australia against Israel's Gaza Blockade and attack on humanitarian flotilla in 2010. The BDS Movement uses the means of boycott, divestment and sanctions against Israel. The campaign has organised demonstrations and protests targeting companies that have contracts with the Israeli military or with companies in Israeli settlements. Actions may also target prominent individuals who openly support settlements businesses. Social media platforms are used to draw attention to BDS activities. With public calls on social media, protests, petitions and articles, pressure is put on individuals to cancel their participation in events in Israel or in Israeli settlements, such as concerts or academic events. On the other hand, Israelis are pressured not to take part in activities outside Israel or the Occupied territories. Participants in events are sometimes demanded to declare solidarity with the Palestinian cause. BDS also makes use of Israeli Apartheid Week, which is an annual series of university lectures and rallies against the Israeli occupation of the West Bank and Gaza. The series is normally held in February or March. According to the organization, "the aim of IAW is to educate people about the nature of Israel as an apartheid system and to build BDS campaigns as part of a growing global BDS movement." Since IAW began in Toronto in 2005, it has since spread to at least 55 cities around the world including locations in Canada, France, Germany, India, Italy, Austria, Jordan, Japan, Korea, Brazil, Botswana, Malaysia, the United Kingdom, the United States, South Africa, Mexico, Norway, Australia, and Palestine. The Anti-Defamation League, the Simon Wiesenthal Center and Israeli officials categorize the BDS movement as antisemitic. Abraham Foxman penned an advertisement that ran in The New York Times that criticized Brooklyn College's political science department for sponsoring a conference promoting BDS. In the ad, Foxman referred to the BDS movement as antisemitic "at its very core". The "double-standards" argument claims that the BDS campaign singles out Israel, or that it judges the state with standards different from those used to judge other political situations. For example, Charles Krauthammer writes: "Israel is the world's only Jewish state. To apply to the state of the Jews a double standard that you apply to none other, to judge one people in a way you judge no other, to single out that one people for condemnation and isolation – is to engage in a gross act of discrimination." Retired Harvard Law Professor Alan Dershowitz compares the way BDS proponents "single-out" Israel for its human rights violations with the way Harvard president A. Lawrence Lowell defended his decision to impose anti-Jewish quotas in the beginning of the twentieth century. When asked why there should be a quota on Jews, Lowell replied, "Jews cheat." When reminded that Christians cheat too, Lowell responded, "You're changing the subject. We are talking about Jews now." The accusation that supporters of the campaign make antisemitic statements or engage in antisemitic activity. For example, some supporters compare Israel's contemporary treatment of Arabs to Nazi Germany's treatment of Jews during the Holocaust and deny Israel's right to self-determination. 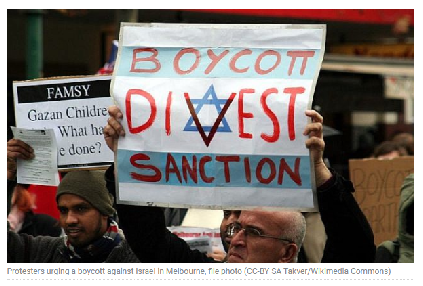 The Australian attributes BDS supporters with antisemitic activity including the publication of material on the Internet that denies the Holocaust and promotes attacks against "Jews and Jew lovers". Seeing similarities, or exact identification, between BDS and historical acts of discrimination against Jewish minorities, such as historic antisemitic boycotts such as the Nazi boycott of Jewish businesses. The argument that BDS is a significant step in the creeping normality of antisemitism. In the case of academic boycotts, BDS targets Israelis who are often on record as opposing the continued Israeli presence in Palestinian territories and supporting Arab–Israeli peace initiatives. According to Ira M. Sheskin of the University of Miami and Ethan Felson of the Jewish Council for Public Affairs, BDS efforts have, at times, targeted Jewish individuals who have little or nothing to do with the Arab–Israeli conflict. Jay Michaelson wrote an editorial in The Jewish Daily Forward critical of Foxman's position. His editorial mentioned that several leaders of the BDS movement are themselves Jewish and state that the ADL, "with every pro-censorship stance it takes [...] loses more and more credibility and cheapens the meaning of the term 'anti-Semitism' itself". Judith Butler asserts that BDS' demands are fully compatible with, and derived from, international standards for human rights. From this Butler draws the conclusion that equating BDS with antisemitism amounts to the assertion that those standards are antisemitic. The "double-standards" argument has seen several types of rejoinders. Some argue that Israel is one of the most highly subsidized American allies and that thanks to their unique political and historical relationships with Israel, Americans have a special responsibility to the status of human rights in that country. Another reason for treating the Israeli case differently is that the call for boycott is the result of a unified effort by numerous civil societies whose members see themselves as the victims of Israeli human rights violations. An example for this latter effect can be found in the words of scientist Stephen Hawking, explaining that his decision to withdraw from Israel's Presidential Conference was motivated by calls from Palestinian academics, who were unanimous in their conviction that he "should respect the boycott". Another rejoinder holds that eventually, all countries must be held accountable to human rights standards, but that there is no standard answer to the question of which should be held accountable first. The ad hominem argument claims that personal attacks of BDS supporters are logically irrelevant, because they focus on individuals' character, acts, and/or motivation, rather than on the arguments for or against the BDS initiative in and of themselves. Butler argues that the allegation of anti-Semitism springs necessarily from a false "generalizations about all Jews", presuming that "they all share the same political commitments" while ignoring a view prevalent among some Jews who were "exceedingly critical" of the state. A similar line of reasoning was developed by Omar Barghouti, who claims that those who criticize BDS as an attack on all the Jewish people are equating the latter with the state of Israel. Suggested similarities between BDS and boycotts imposed on Jews by antisemitism have been challenged by Daniel Blatman, Professor of Holocaust and Genocide Studies at the Hebrew University. Blatman, a liberal Zionist and an opponent of BDS, argues that "the boycott imposed on Jews by antisemitism and the boycott of Israel today have nothing in common... The antisemitic boycott movement was directed against the authorities who had not acted against those who were not considered to belong to the nation, and even deemed the nation's enemy. The Israeli equivalent of the boycott movement can be found in right-wing circles, who have called for a boycott of Arab produce...."
According to Jonathan Schanzer, vice president of research at the Foundation for Defense of Democracies and a former terrorism finance analyst for the U.S. Treasury Department, there are links between American supporters of Hamas and the BDS campaign. In April 2016, Schanzer testified before the U.S. House Subcommittee on Terrorism, Nonproliferation, and Trade that "in the case of three organizations that were designated, shut down, or held civilly liable for providing material support to the terrorist organization Hamas, a significant contingent of their former leadership appears to have pivoted to leadership positions within the American BDS campaign." WHO FUNDS THE BDS MOVEMENT AGAINST ISRAEL? Many Palestinians have come to the realization that they can only destroy Israel via soft asymmetrical conflict rather than waging war or committing terrorist acts. Who is funding the BDS Movement that stands at the forefront of Palestinian soft asymmetrical conflict attempts? Many Palestinians have come to the realization that waging wars and implementing terrorist attacks won’t lead to the destruction of the State of Israel. Therefore, they have implemented a new method of warfare known as soft asymmetrical conflict. Berlin’s mayor will block the use of city venues and funds by groups or event organizers that support the boycott movement against Israel. The Knesset approved a bill that bars entry into Israel of proponents of boycotts against the country, on Monday, with 46 voting in favor and 28 voting against. He stressed the proposed bill does not constitute a dramatic change in Israel’s immigration policy. The bill denies entry to individuals calling for a boycott of Israel or those who represent an NGO that does so, but allows the Interior Minister to make exceptions. Under the current law, the Interior Minister already has the right to bar individuals from entering Israel. The bill entails creating a list of individuals and organizations deemed anti-Israel, and gives the minister the ability to offer exemptions to anyone on the list. He added the bill does not counter legitimate criticism, and it pertains to situations in which red lines are crossed. “They are not talking about boycotting only the settlements [communities in Judea and Samaria]; they are talking about boycotting the state as a state, they are not making a distinction. We are talking about people I think are anti-Semites,” he added. After the bill passed, Smotrich said the law reflects the will of the state to fight its enemies. “What does this law say, after all? A healthy person who loves those who love him and hates those who hate him doesn’t turn the other cheek,” he said. Several MK’s on the left decried the bill as an attempt to stifle legitimate criticism of Israel. Israel's Deputy Foreign Minister Tzipi Hotovely (Likud) set out on a campus tour in the US Wednesday night in a first-ever visit of a senior Israeli politician to Ivy League university campuses in order to combat prevalent propaganda against the Jewish state and the mounting threat posed by the Boycott, Sanctions and Divestment movement (BDS) who are active in such academic institutions. Ahead of her departure, Hotovely said that she intended to "talk to the younger generation in the US who [sic] grew up hearing lies about Israel. It is important for me to share with the common challenges that radial Islam poses to democratic countries and to tell them the success story of the State of Israel, which thrives in the face of all challenges." Among the elite colleges the deputy foreign minister is slated to visit are New York University, Columbia University and Princeton University. "The university campuses are one of the most difficult and important arenas, and I come as a representative of the government and a representative of the ruling party on a journey that will begin the hard work of changing the trend toward Israel on US campuses. Students who Identify with Israel will no longer be afraid to speak their minds," she said in a statement. Hotovely also launched an initiative prior to her departure to help promote Israel advocacy abroad and to counter movements that are calling for a financial and social boycott of the Jewish state. At her behest, Jerusalem's Foreign Ministry released four booklets that it plans to make available for Israel advocates on campus. Every booklet, according to Hotovely's office, tackles a "core issue relating to the 100-year conflict with the Arabs." The series is titled "Israel Basics" and each booklet comes in a different, basic color. A booklet about the Jewish settlements is named the Green Booklet, a booklet addressing the issue of terror that has plagued the country is named the Red Book, a third one relating to peace negotiations is named the Yellow Booklet and a fourth, titled The Miracle of Israel, is also dubbed the Blue Booklet. Hotovely also intends to meet with pro-Israel activists to learn about the difficulties they face in presenting Israel's struggles on campus. "My goal is to hear from them and learn what we can do to help," she added. The deputy foreign minister is also scheduled to meet with officials from the Jewish community in New York and participate in the IAC conference in Washington during her visit. Just a week before Hotovely's visit a watchdog that seeks to investigate, document and combat antisemitism on university campuses in the US released an alarming report that pointed at a strong correlation between the prevalence of antisemitic and pro-BDS approaches on campuses and the occurrence of anti-Zionist expressions uttered at department-sponsored events. WASHINGTON — Founders of a new and exhaustive informational website hope that their project will provide a powerful tool to beat back the Boycott, Divestment and Sanctions movement’s inroads on college campuses — and it may just break some records along the way. Offering a deluge of information on Jewish identity, Israeli studies and –yes — the Israeli-Palestinian conflict, the professors behind the project hope that it will provide a key to stemming the tide of BDS arguments in higher education, and even help to forward their goal of a two-state solution. The website, Israel and the Academy, debuted Thursday as the latest initiative by a group of senior American academics, mostly affiliated with the anti-boycott MLA Members for Scholars’ Rights. The faculty members, many of whom have been on the front lines of the struggle against the academic boycott of Israel for the better part of a decade, envisioned a website that would provide all of the informational resources necessary to counterbalance — and at times challenge — BDS activity on campuses. The idea of a clearinghouse website was first floated in May 2015, when a group of some 15 faculty members met to determine their next course of action. “BDS over the past few years has ramped up its activities so much more aggressively, that many more associations — I think a dozen of them — have been involved in those debates. It kind of became clear that we should be talking to one another,” explained Professor Cary Nelson, one of the leading voices against BDS in US academic circles. “The group was unanimous in feeling that the thing we really most needed was a rich website that people from communities, universities, government offices and anywhere else could go to for a repository of information that they would need to engage in these struggles,” he explained. The website’s advisory board constitutes about two dozen academics, who reached out to friends and colleagues asking for essays and especially syllabi to be shared on the new platform. Although the initial process was slow, the results were massive. The website now will include over 450 syllabi, making it the largest resource of its type — offering free-access syllabi — in the world, according to the founders. “Other versions of syllabi banks are much smaller, and are also behind paywalls. You have to be a member of some association to see them,” Nelson said. This resource will contain syllabi on topics ranging from the binding of Isaac as a foundational motif in Jewish thought, to synagogue architecture through the ages. Scholars were also asked to self-select their best and most interesting publications and put them on the website as well. They have put up similar dossiers of documents from BDS debates held in academic professional organizations, such as Nelson’s own Modern Language Association, which is expected to revisit its rejection of a BDS vote during its annual meeting this January. But in true academic style, the short-form materials are backed up by much more in-depth resources, including a set of essays critiquing BDS and packets of essays and information for book-length studies on particular subjects including “pinkwashing,” apartheid and the two-state solution. The project, Nelson says, has an “intellectual commitment” to the two-state solution. 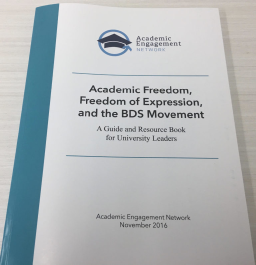 In November 2016, AEN published Academic Freedom, Freedom of Expression, and the BDS Movement: A Guide and Resource Book for University Leaders, directed at university leaders, namely presidents, chancellors, provosts, and deans. The aim of this publication is to inform university leaders about the challenges that the Boycott, Divestment, and Sanctions (BDS) movement pose for universities and colleges and for academic values. The book offers constructive guidance and a range of suggestive examples about effective responses to such challenges when they appear. The Guide is organized in two parts: the first part is titled “BDS, Academic Freedom, Free Speech, and the University,” and includes sections on the rise of BDS, on BDS campaigns for boycott and divestment, and also on BDS-inspired efforts at the disruption of free expression by others on campus. While BDS speech is constitutionally protected speech, BDS goals and methods are sources of challenges to academic freedom and freedom of expression. A key feature of the guide is its emphasis on the importance of university and college leaders speaking out forcefully against the methods employed by BDS, especially where they impinge on academic freedom and freedom of expression. The second part is titled “Student Conduct Codes and Procedures,” and explores the many ways in which well-constructed codes of conduct and thoughtful protocols for enforcing them at difficult moments can help universities and colleges protect freedom of expression. The Guide contains several appendices: selected university leadership statements, recent initiatives, and examples of responsible student conduct codes and procedures. The Guide also includes some guide sheets and handouts developed by professional organizations with which the Academic Engagement Network works cooperatively. These include the Anti-Defamation League, the Louis D. Brandeis Center for Human Rights Under Law, and others. To request a copy of this guide, please contact info@academicengagement.org. In recent years, demonizing Israel online has increased thanks to the BDS movement. Here are the organizations working to combat that. Pro-Israel students use Internet to fight BDS. When it comes to spreading hate on the Internet the rules against such vitriol are few and far between. But dedicated, pro-Israel activists have decided to take matters in their own hands, defend Israel and hit Boycott, Divestment and Sanctions (BDS) operatives where it hurts the most: rendering them ineffective in the social media landscape. Below is a snapshot of conversations The Jerusalem Post had with organizations leading this fight online. ‘The strategic messaging hub of the pro-Israel community’ Lior Weintraub, The Israel Project VP & director of Israel office In Lior Weintraub’s eyes, the Boycott, Divestment and Sanctions operatives are already losers. “When people read about BDS in the media, they get the sense that the delegitimization campaign is winning. But it’s not, it’s losing in a big way,” The Israel Project’s vice president and director of its Israel office, argued. To fight against the hate spewed by BDS, TIP uses a methodical, multi-pronged approach, using professional tools and working as a strategic hub for the whole pro-Israel community, sharing messages, research and expertise with a wide variety of organizations to make the entire community much more effective. From its Tower Magazine, to a vibrant social media presence (boasting two billion Facebook impressions in 2016) to its seasoned team of communications professionals, TIP prides itself on being advocates of Israel in a tactical and calculated way. “We are the only ones applying the tools and methodology of a political campaign, such as polling, message testing and micro-targeting, when it comes to educating people about Israel,” he said, adding that he has 20 years of communications experience under his belt including four as chief of staff and spokesman of the Israeli Embassy in Washington. Their strategy is a two-pronged one: Highlight everything Israel should be proud of – achievements that boost the Jewish state’s place in the world and reinvigorate Jewish pride – while exposing the true nature and failures of the BDS movement. In other words, the idea is to draw attention to Israel as the home of innovation, culture and tikkun olam and expose the seedy underbelly of BDS. “We highlight the fact that instigators and leaders of BDS expose their real face when they reject the legitimacy of Israel. This is not a peace-seeking movement. This is a movement that wants to wipe Israel off the map,” he said. The controversy surrounding singer Matisyahu’s performance at a Spanish music festival two years ago is an example of TIP in action. The organization frequently posted in its social media platforms outrage that boycotters expelled the Jewish reggae musician from performing. The backlash was so vociferous, that organizers invited the singer back to perform within a week. That is not to say that pro-Israel groups are always on the ball when responding to such matters, especially when it comes to the country’s image. “An image problem is a strategic problem,” he said. “An image problem is crippling to Israel’s soft power, its ability to promote its interests in the international community, and also it has a direct influence on Israel’s security when it comes to defending itself in a volatile and violent region. In many places, we have lost our narrative,” he lamented. A game plan that understands that the pro-Israel community is a diverse one capable of emphasizing the variety of the good Israel does is crucial to formulating a powerful and positive narrative, he says. “Being able to work together as a community in order to promote what we care about and the good things that we’re doing is a strong message we should carry in the most forceful way, because it happens to be the truth,” he added. ‘Turning a boycott into a ‘win’ for Israel’ Michael Dickson, executive director of StandWithUs-Israel, Some think that when faced with an inane or ludicrous accusation, it’s best to not dignify it with a response. But ultimately, ignoring a bully rarely works, which is why StandWithUs believes BDS aggressors must be addressed head on. For example, when BDS operatives propose a boycott of Israeli goods, SWU responds by entreating people to buy those goods in droves. “We have done this to great success on many occasions, and the result is often that instead of boycotting, the product that BDS are campaigning against sells more than ever,” Dickson boasted. As for the campaign online, SWU was an early adopter of the social media landscape as a battle ground. With its ubiquitous presence on Facebook and Twitter operating in 18 languages, SWU is a big draw to the pro-Israel crowd – with 105 million visits to their Facebook page a week alone. And, indicating they are able to shake up the BDS establishment on its home turf, its Arabic social media account was dubbed the “most dangerous for Arab youth to view,” Dickson said. “Rather than allow social media to be a platform for BDS to amplify their lies, we utilize it to reach people around the world and to keep close tabs on their actions,” he said. That is to say, the fight is not easy one. “Israel finds itself under attack like no other country,” Dickson lamented. Founded by Roz and Jerry Rothstein and Esther Renzer 16 years ago, SWU is an independent organization with 18 offices worldwide and an Education Center that hosts tens of thousands of visitors who participate in their education programming. While SWU is a strictly independent organization that does not receive government funding, it does work closely with other organizations to spread its message. Specifically, the Jewish Agency – where it works with its Campus Fellows, a shlihim (emissaries) program – and a slew of Jewish youth organizations like Bnei Akiva and BBYO. “These partnerships and synergies take place week in, week out with schools, shuls, Federations, non-Jewish groups and beyond,” he said. “This is a fight we must fight together The media monitoring organization focusing on ‘accuracy and truth’ Aviva Slomich, international director of campus programs, CAMERA In many ways, CAMERA was prophetic in its mission to counter BDS in a widespread manner considering the media watchdog organization was founded in 1982, well before the BDS movement and social media even existed. “Using social media to broadcast campaigns and messages can be very significant. We take it very seriously. We want to be proactive, not reactive,” Aviva Slomich, international director of campus programs at CAMERA, said. 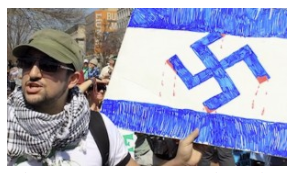 Specifically, nefarious campaigns calling for violence against Israelis or the delegitimization of Israel can be particularly harmful, especially when those messages are seen by impressionable students on college campuses. CAMERA has been an active on campuses for over a decade, however, in 2011 it established its Emet for Israel program where where they “help students create independent Israel organizations on campus to help normalize Israel and proactively educate about Israel on campus,” Slomich explained. Currently operating on 70 campuses, the organization not only focuses its energy on universities where the messaging on Israel is problematic and negative, but also on universities where the talk about Israel is completely nonexistent. The program arms students with the facts needed to defend Israel in public forums. The program’s success hinges on students’ articles in college newspapers that defend Israel and counter pro-BDS messages on campuses. These articles are often picked up by major media outlets giving the original message exponential exposure. “These articles live forever. You have no idea the reach you can get with one article,” she marveled. Ironically, in an environment that prides itself on “safe spaces,” “Jewish students feel antagonized on [college campuses]. It happens all the time. Jews and Zionists feel targeted and excluded and on the outside,” she said, specifically pointing out Linda Sarsour’s visit to Dartmouth University in May. Sarsour has gained notoriety in the pro-Israel world for her anti-Israel statements and, at Dartmouth, a CAMERA student activist openly confronted her on her statement that feminists couldn’t be Zionists. “[Sarsour] attacked the student for being a white male. We put the video online and it went viral. She had no response to [his] specific questions,” she recalled. That said, it’s no easy feat to defend Israel on campus these days and CAMERA acknowledges that. As such, CAMERA teams up with many other pro-Israel organizations like IDC’s ACT.IL program, SWU and the AEPi Jewish fraternity network on campus. “[These students] are taking a huge responsibility to educate their peers and come up against their professors or other students. We want to be there as their support system,” she said. Judging from this imbalance, it seems that U.S. students consider Israel the world’s foremost human rights violator — worse than Syria, China, Russia, Egypt, Sri Lanka, Kenya, Sudan, Bangladesh, Libya, Yemen, Zimbabwe, Pakistan, South Korea, Brunei, Somalia and Saudi Arabia. Of course that’s ridiculous. Yet as a result of a sophisticated Palestinian nationalist campaign — plus a hefty dose of anti-Semitism — it’s modish for students to reserve their most extreme outrage for the U.S.’ chief ally in the Middle East. The pro-Israel side, meanwhile, has proved completely ineffective. We’re losing in part because most pro-Israel organizations have a long history of supporting Israel, not fighting for Israel. They operate on the assumption that the best way to battle BDS is through education — a long-term solution that won’t work in the campus battles so long as pro-Israel faculty and students remain in the minority. Even when we “defeat” BDS resolutions and pop the champagne to celebrate, the BDS movement is already plotting its next attack. BDS’ only time frame is the destruction of Israel. For supporters, there are no defeats, just opportunities. When a BDS resolution fails, proponents will introduce another resolution within days, weeks or months, giving the movement more opportunity to spew propaganda against Israel and sway people to their cause. It’s time to try something different. Here is a simple solution that will help end BDS on university campuses: Turn BDS into a meaningless acronym. If a university’s pension fund invests in McDonald’s, target McDonald’s for licensing restaurants in Saudi Arabia, where executions of homosexuals continue. If the fund prefers Starbucks stock, target Starbucks for operating coffee shops in Pakistan, or Brunei, or in China, which is occupying Tibet. Meanwhile, create Web platforms and social media campaigns in the dramatic and successful BDS style. Produce short films that highlight the offending countries’ extensive and deplorable human rights violations. Whenever I’ve shared my ideas with pro-Israel students, they’ve had similar reactions: “Two wrongs don’t make a right” or “We should promote Israel rather than attack other companies and countries.” The first response is inaccurate because the resolutions against Israel generally trade in falsehoods, while the new resolutions against other countries will be factual. As for the second response, maybe it’s time for pro-Israel supporters to get some chutzpah.